1.God speaks to us in his word. There is nothing like quieting all the voices around us to open the Bible and hear from God. The word is living and active and God will use it to speak to the circustances of our lives. God can speak very personally and practically through his word. His word helps to guide us, to give wisdom, to discern, to teach, to correct, to warn and to affirm. 2. God’s word bring us into God’s presence. Scripture has been breathed out by God. In fact, “…to have the Word of God is to have God Himself, for when Scripture speaks, God speaks.” To understand the word and to apply the word, we must have the Spirit working in us. And with God comes the fullness of his peace, his deep love and his joy. 3. God’s word reminds us who he is. God reveals himself on every page of the Bible. He reveals his character and how he deals with mankind. We cannot read the Bible without seeing that God is sovereign, that he’s all powerful and that his plans always prevail. 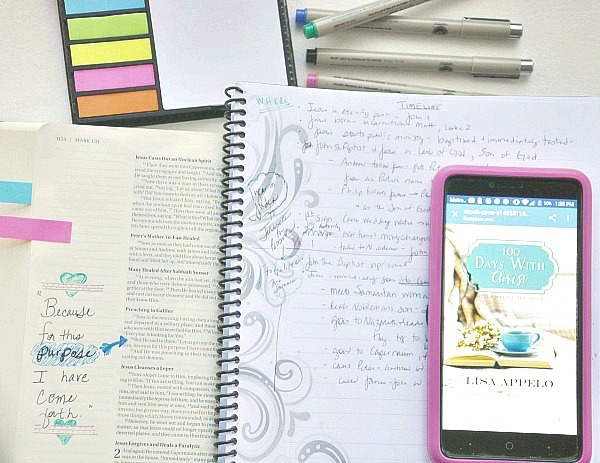 Bible study realigns our heart so that we are more overcome with God than overwhelmed by our circumstances. 4. God’s word reveals his promises. God’s word is chock full of promises. Getting into God’s word every day not only reminds of his promises but God’s constant faithfulness to those promises. He was faithful to Noah. He was faithful to Joshua. He was faithful to Daniel and faithful to Nehemiah. Our circumstances don’t tell the whole story because God’s promises are at work and will be fulfilled in his perfect timing. We can count on God coming through and we can wait well because we know without a doubt that God can only ever be faithful. 5. God’s word shows there’s joy even in suffering. Scripture makes clear we aren’t alone in suffering. Almost every single person in the Bible that God used mightily experienced some kind of suffering – there’s not room enough for a list but let’s start with Abraham and Sarah, Rebecca, Jacob, Joseph, Moses, Ruth, David, Elijah, Esther, Paul and John. Jesus himself suffered and God walks with us in our suffering. Scripture tells us God gives us grace sufficient for our suffering and that there’s purpose in suffering. And finally, scripture assures us that difficulty here is preparing us for an eternity of glory that far surpasses even the hardest suffering. 6. God’s word helps clean out our sinful hearts. Look, there are two ways God can disciple us. The hard way? To go against God, feel the sting of consequences and correction, and decide not to do that again. The easier way? To stay in God’s word and let it continually wash over our hearts so that we’re warned away from rebellion or so that we realize our sin and re-align our hearts to God’s. Daily time in God’s word allows him to constantly clean out sin and ushers in fresh joy. What sparks joy for me? Time alone with God in his word. Not reading a meme that talks about God. Not reading someone else’s words talking about God. But reading the word of God for myself. Every day, God, help us come to your word with ears open, heart ready, spirit willing and the only agenda to meet you there. Want encouragement right in your inbox? Subscribe here and I’ll send my free 100 Days with Christ Bible study and journal. All that is light and worthless floats away, only the heavy metal stays in the pan. Is meditating on God’s Word and finding what He has for you today. All that is fluff and worthless floats away, only the truth for today remains. What a great metaphor. Let the word wash over us! Wow, Lisa! This post speaks to my heart, friend. I love how you have outlined so many benefits and joys of God’s Word right here. So grateful we can go to God’s word every morning for fresh word from him, no matter how many times we’ve read that passage or chapter. His Word proves so powerful. There’s nothing better than a one-on-one session with the Lord. I find that truly brings me joy, too, Lisa. Have a beautiful day! God’s word lifts us out of darkness and despair and brings us into His life. The best joy boost. This is such a great reminder. Staying in Gods word always brings me joy and refreshment especially in the midst of chaos. Thanks for always reminding us of truth. So true, Carol. Reading God’s word centers us like nothing else. Your words spoke such encouragement to this weary and stressed heart this evening. I especially liked when you said, “I give God my burdens and take back his abiding joy and peace. ” Love this!! It reminds me that abiding joy and peace can be our constant state, but we end up drowning it out with carrying burdens we were never meant to carry. Thank you so much for this word picture. Great list, Lisa! It’s so easy to underestimate God’s Word, when actually it is something we need SO desperately. 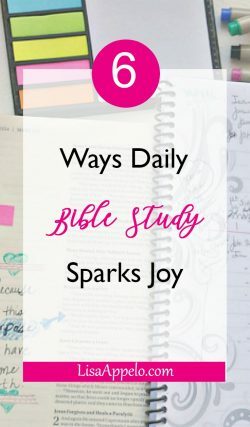 You’ve encouraged me with this post to dig into the Scriptures personally, and also to faithfully share it with others when God gives me the opportunity. His living, powerful, and active Word can make a real difference in anyone’s life! Thanks for sharing.